Status: Available for immediate download delivery. California land ownership has changed over time starting with Spanish land grants. Understanding where the records are depends on the historical time period. A good map of California is a must and over time the map of this state has evolved from showing California as an island to the California we know today with 59 counties. We will take a look at land records historically and where they can be found. 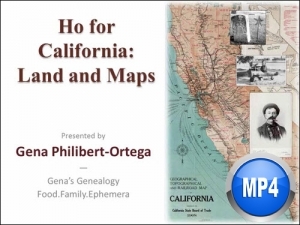 We will also look at maps through the history of California and what map collections can help you better understand the places your ancestor lived. 1 hour 3 minutes, plus 7 pages of handouts. The recording is also included as part of the�monthly�or�annual�membership. All Rights Reserved © 2016 FamilyTreeWebinars / Product subscriptions powered by Modular Merchant shopping cart software.